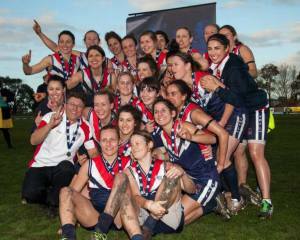 Darebin have defeated rivals Diamond Creek 14.7 (91) to 6.6 (42) in the 2013 VWFL Premiers Grand Final to end a record unbeaten season with the Susan Alberti Cup and the title of VWFL Champions. 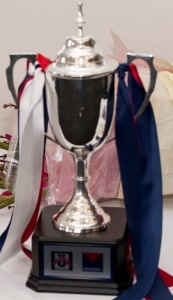 Following the Reserves Finals, the Premiers Final got underway. As expected of these two powerful teams, the defence was strong at either end and despite having the best goal kickers in the league, the two teams went into the first quarter break with a goal a piece and one point between them. In the second quarter Darebin quickly showed they had more to prove and added 5 goals to the scoreboard to the Creekers’ 2, and went back into the dressing rooms at half time with a deserved 17 point lead. From there on it was hard for the Creekers to break the Falcons’ momentum. Darebin added another 3 goals to the tally during the third quarter, and despite Diamond Creek’s efforts to stay in the game, they could only produce a single goal. In the fourth quarter, the Falcons could taste victory and were determined to swoop down on the Creekers and claim the VWFL Champions throne. Darebin dominated the oval and added a further 5 goals to their score, including a Darcy Vescio hat trick.